Here we are, another fall season upon us. A season full of great comfort meals like soups, stews, and baked goodies galore! I’ve been a huge fan of squash for a couple years and more recently, as a paleo eater, I have a newfound appreciation for these “starchy” vegetables since starchy grains are relatively forbidden. Spaghetti squash replaces spaghetti pasta, mashed butternut squash replaces rice side dishes, roasted acorn squash is another delightful and filling alternative. Halloween is upon us and in keeping with the squashy season and the pumpkins of jack-o-lantern and pie fame, I made some pumpkin butter. It’s a nice paleo friendly treat to spread on some coconut pancakes or drizzle over cubed and roasted sweet potatoes. Another bonus: While cooking, it makes the house smell amazing. * You can make your own pumpkin pie type spice by combining 1/2 tsp ground ginger, 1/4 tsp ground cloves, 1/8 tsp ground nutmeg. You do not need to add cinnamon since it is already included above, however, if using this spice for another recipe; you would want to add 1 tsp ground cinnamon to the mix. Combine the pumpkin, agave nectar, maple syrup and vanilla extract in a small saucepan over medium heat, mixing until well combined. Stirring constantly, cook for about 15 minutes, or until thickened. Stir in the spices and salt, and cook for an additional 5 minutes. 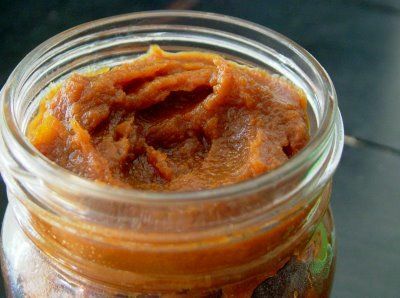 Remove the pan from heat, and transfer your pumpkin butter to a small bowl or jar. Let cool completely before covering and refrigerating. Pumpkin butter will keep for about 2 weeks in a covered air tight container in the refrigerator.